The Voyage of Life, painted by Thomas Cole in 1842, is a series of paintings that represent an allegory of the four stages of human life: childhood, youth, manhood, and old age. 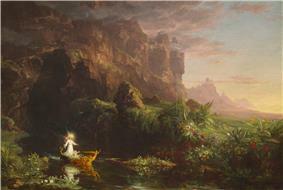 The paintings follow a voyager who travels in a boat on a river through the mid-19th-century American wilderness. In each painting, accompanied by a guardian angel, the voyager rides the boat on the River of Life. The landscape, corresponding to the seasons of the year, plays a major role in telling the story. In each picture, the boat's direction of travel is reversed from the previous picture. In childhood, the infant glides from a dark cave into a rich, green landscape. As a youth, the boy takes control of the boat and aims for a shining castle in the sky. In manhood, the adult relies on prayer and religious faith to sustain him through rough waters and a threatening landscape. Finally, the man becomes old and the angel guides him to heaven across the waters of eternity. Unlike Cole's first major series, The Course of Empire, which focused on the stages of civilization as a whole, The Voyage of Life series is a more personal, Christian allegory that interprets visually the journey of man through four stages of life: infancy, youth, manhood and old age. Done on commission, the finished works generated a disagreement with the owner about a public exhibition. In 1842, when Cole was in Rome, he did a second set of the series which on his return to America was shown to acclaim. The first set is at the Munson-Williams-Proctor Arts Institute in Utica, New York, and the second set is at the National Gallery of Art in Washington, D.C. Detail of Thomas Cole's The Voyage of Life: Childhood: The boat, child, and angel on the water. Detail of Thomas Cole's The Voyage of Life: Youth: shows the boy departing in the boat; the angel bids him farewell from the shore. To the youth, the calm river seems to lead straight to the castle, but at the far right of the painting one can just glimpse the river as it becomes rough, choppy, and full of rocks. Cole comments on the landscape and the youth's ambitions: "The scenery of the picture—its clear stream, its lofty trees, its towering mountains, its unbounded distance, and transparent atmosphere—figure forth the romantic beauty of youthful imaginings, when the mind elevates the Mean and Common into the Magnificent, before experience teaches what is the Real." This painting was used as the cover of the album Ancient Dreams by the Swedish doom metal band Candlemass. Detail of Thomas Cole's The Voyage of Life: Manhood: God is depicted in the clouds. 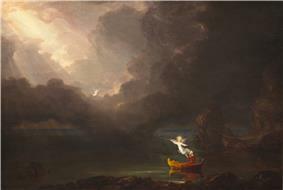 Detail of Thomas Cole's The Voyage of Life: Old Age: The man in the boat with the angel. 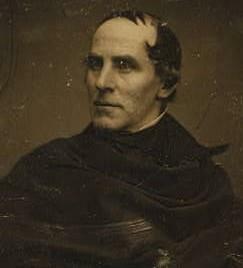 The Voyage of Life was well received by critics and the public; the United States was experiencing the religious revival sometimes known as the Second Great Awakening. The four paintings were converted to engravings by James Smillie (1807–85) after Cole's death and the engravings widely distributed in time for the Third Great Awakening, giving the series the prestige and popular acclaim it retains today. Powell, Earl A. (1990). Thomas Cole. New York: Harry N. Abrams. Miller, Angela (1993). The Empire of the Eye: Landscape Representation and American Cultural Politics, 1825–1875. Ithaca, N.Y: Cornell University Press. Noble, Louis Legrand (1853). The Life and Works of Thomas Cole. Black Dome Press. Powell, Earl C., III (1997). 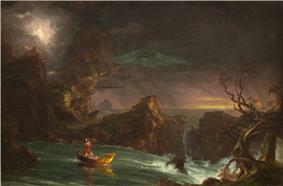 "Thomas Cole's Voyage of Life in the National Gallery of Art". Magazine Antiques (January 1997). 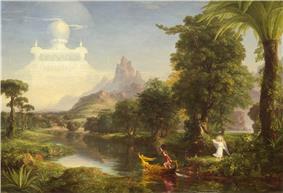 Thomas Cole, The Voyage of Life, Middle East, Netherlands, Washington, D.C.